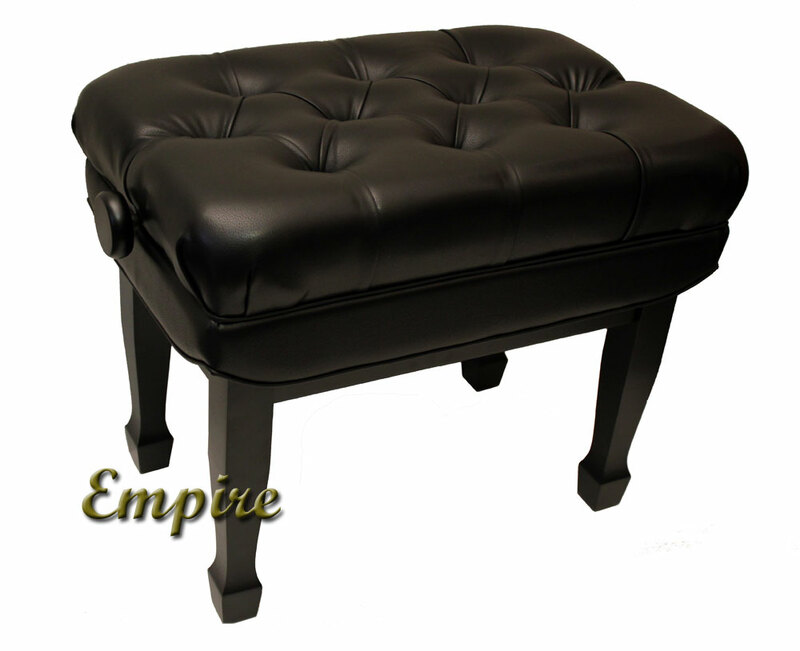 The Empire Concert Artist Bench is a luxurious adjustable piano bench that offers superb quality at a very affordable price. 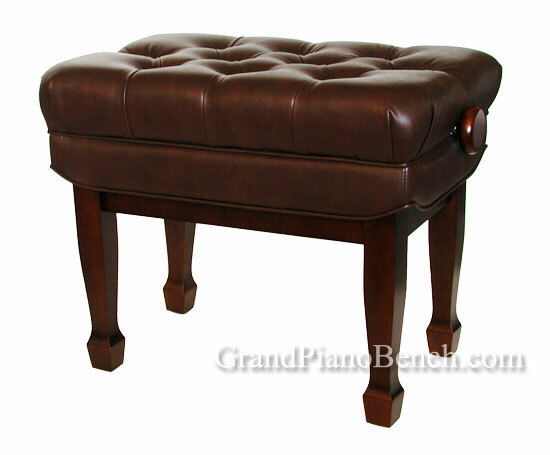 It is constructed of 100% hardwood, and features a heavy-duty adjustable raising mechanism, which allows for an adjustable height of 18" to 22 1/2". The artist bench has spade legs, which have rubber bumpers on the bottom to protect your floor from damage. 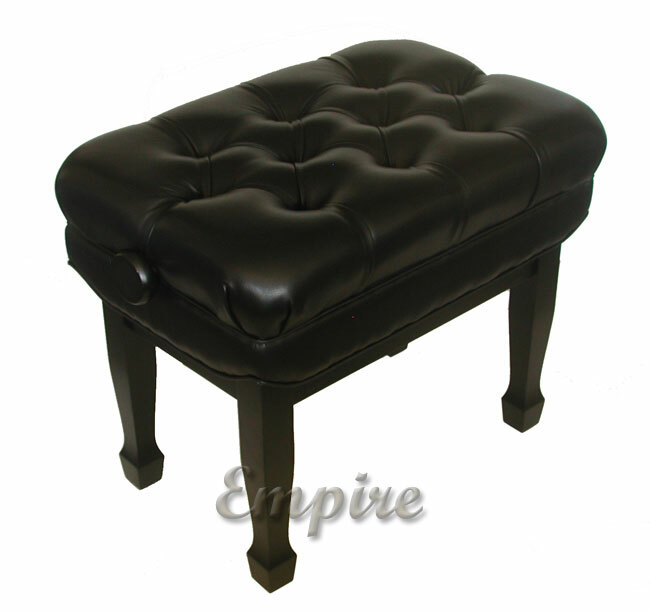 The piano bench is available in black satin, black high polish, walnut and mahogany. One of the great draws of this piano bench is its comfort. 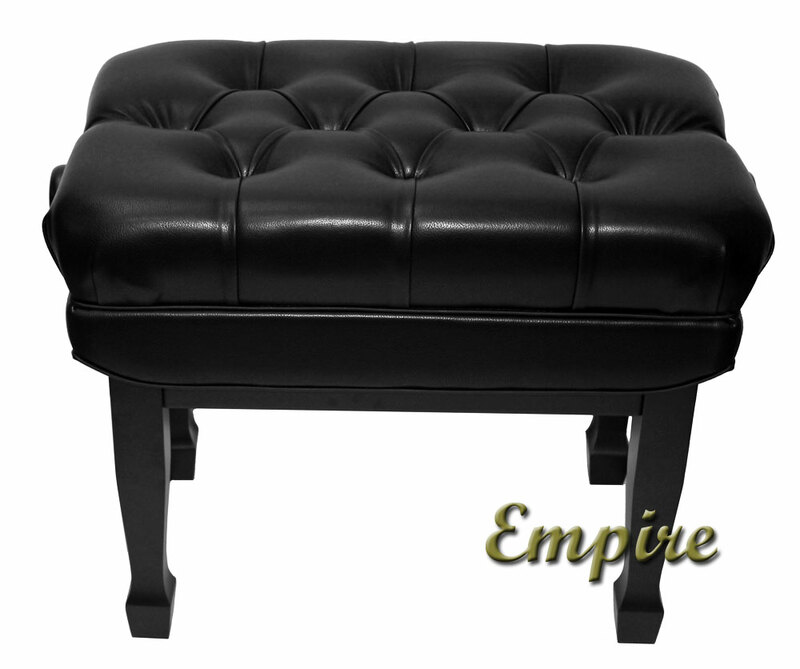 The Empire bench uses an extra-thick cushion, which is very soft, to provide the ultimate playing experience. By comparison, a Jansen artist bench uses a very firm foam, whereas this is much more "pillow like." 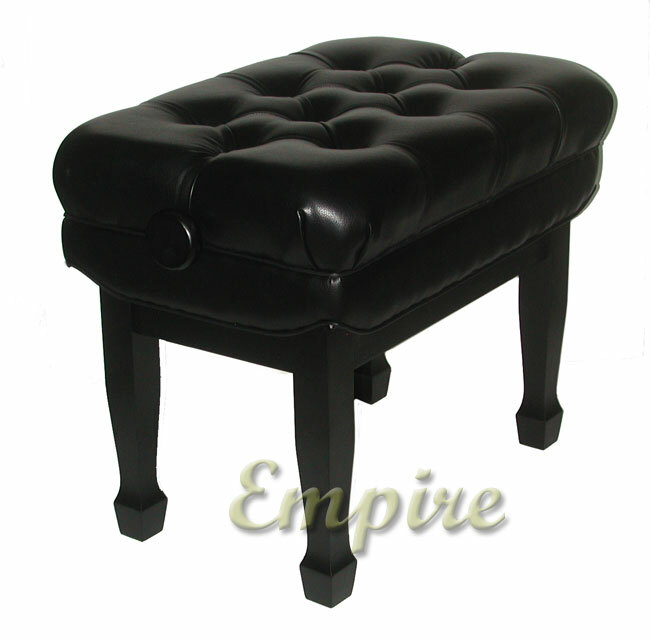 Furthermore, the artist bench uses furniture grade vinyl, and is hand tufted with 10 buttons, adding style and durability (tufted buttons provide structure and stability to an upholstered top, and a tufted top will hold up better and last longer that a simple flat top). Adjustable Height= 18" to 22.5"
It is worth noting that the Empire artist bench is not only a good sized piano bench, but that it is on the larger side of ALL artist benches in terms of dimensions. The OSP bench for example, is 22" x 13.5", and GRK's Woodmaster artist bench is 22" x 15". 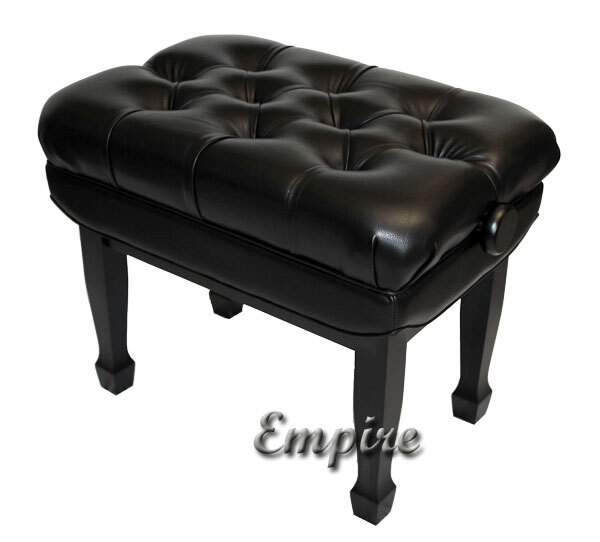 Therefore, the Empire adjustable artist bench is 2"-3" bigger in both directions than most other artist benches. In fact, it's even bigger than the Jansen artist bench, which is 21.5" x 16.5". With regards to adjustable height, this bench also fares well, going slightly higher than any other bench we've seen. Again for comparison, the Jansen adjusts from 18"-21", OSP 19"-21.5" and the GRK woodmaster 18"-22". So if you are looking for that extra inch to an inch and a half, this would be a good solution. Perhaps the best way to tell the quality of the materials of a piano bench is in how much it weighs. The Empire Concert Artist bench weighs an impressive 36 pounds. In comparison, the popular OSP artist bench only weighs 22.5 lbs. 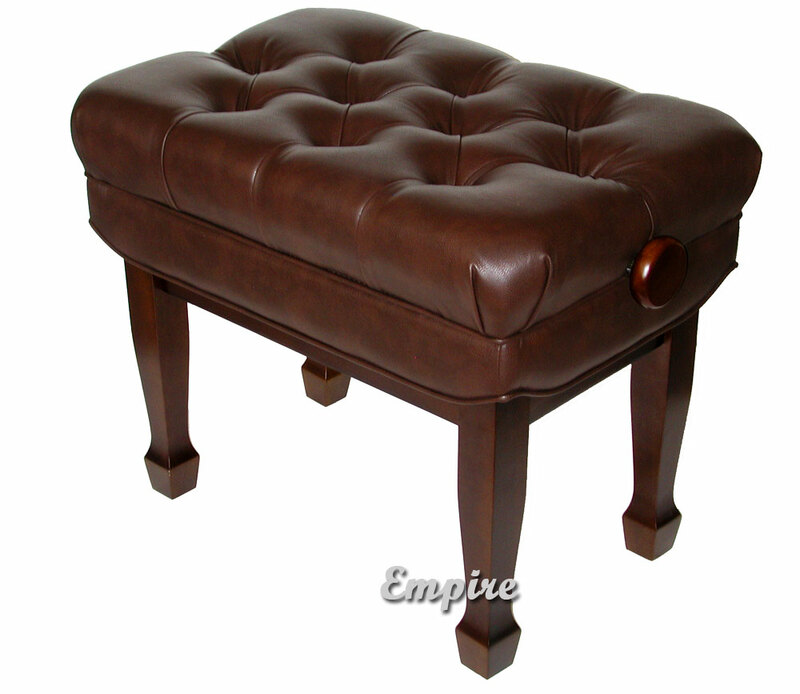 In sum, compared to other benches in similar price range, it is bigger, the wood is thicker and of better quality (i.e. the frame and legs), and the adjustable mechanism is heavier and more durable. As you can tell from our above descriptions and comparisions, we give the Empire Concert Artist Bench a rave review. In the $150-$400 price range, this is the best bench on the market in our opinion, and we've seen nearly all that are available. 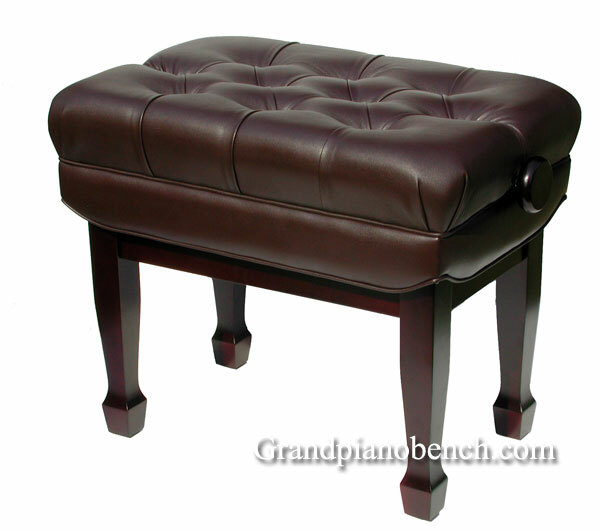 In comparison to the others, it offers an extra thick and plush cushion, it is a larger bench in terms of it's dimensions, and above all it's a well constructed and attractive piano bench. If I peronsally was going to buy a mid-range priced artist bench to put next to my Steinway Grand Piano, it would be this one.